Richard C.C. Peck, Q.C. is the founding partner of Peck and Company and is widely regarded as one of the leading criminal lawyers in Canada. He has practiced in criminal law for over 40 years. A lifetime resident of Vancouver, British Columbia, Mr. Peck received his LL.B. from the University of British Columbia Faculty of Law in 1974 and was called to the British Columbia Bar in 1975. In 1987, he was appointed Queen’s Counsel. Mr. Peck has appeared as counsel at all levels of court in Canada, including the Supreme Court of Canada on numerous occasions. 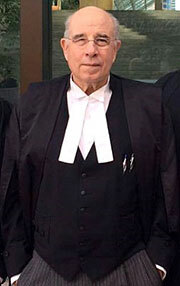 He has represented clients in some of British Columbia’s most well-known and complex cases. Mr. Peck is also a special prosecutor and has conducted numerous prosecutions on behalf of the Ministry of the Attorney General. In addition to maintaining his legal practice, Mr. Peck is a dedicated contributor to and participant in the legal community, both domestically and internationally. Mr. Peck is a Life Bencher of the Law Society of British Columbia, Co-Chair of the Federation of Law Societies of Canada’s National Criminal Law Program, Chair of British Columbia’s Regional Committee of the Supreme Court Advocacy Institute of Canada, a Director of the Legal Historical Society of British Columbia, and has been an Adjunct Professor at the University of British Columbia Faculty of Law. As well, Mr. Peck is a fellow with both the American College of Trial Lawyers and the International Society of Barristers, and a Director of the International Society for the Reform of Criminal Law. Mr. Peck is also the author of a wide variety papers and publications in the area of criminal law and has regularly contributed to continuing legal education programs for over 20 years.